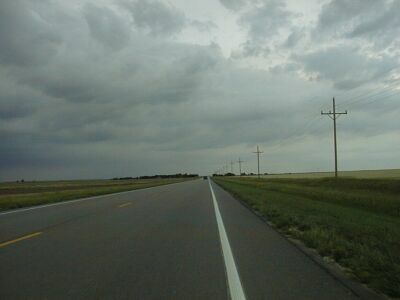 A beautiful ride, especially the part in Oklahoma, ending in a rainstorm as I arrived in Dodge City. I did 120 miles, leaving Woodward at 7:30 AM and arriving in Dodge at 5 PM. Since I ate several meals and had several in between meal rest/snack stops, riding time was probably about 7 and a half hours. That works out to about a 17 mph average. Moreover since 20 miles of this ride was at about 10 mph due to hills and cross winds, my average speed while riding with the wind was around 20 mph. Again, aren't those tailwinds wonderful! I got up early, knowing that I had a long ride ahead of me and knowing that a line of thunderstorms was predicted to come though Dodge this evening. That line extended all the way across Kansas and much of Oklahoma so there was no way to avoid it except by getting here before it did. I didn't. Eating breakfast at the motel, I had a nice visit with a truck foreman for a construction company. The company originated in Dodge, but now has asphalt plants all over western OK and KS. It recently passed on to the third generation of the family that started it. The bean counters (apologies to accountants, one of my best friend is one, etc.) are now in control and things are not going well for the workers. It was an all too familiar slice of corporate bottom line management. This fellow's crews were hauling asphalt in the area of the first part of my ride so he said he'd let then know to look out for me. I don't know if it helped, but I had no problems with trucks and there were more trucks than cars on my route today. I headed out on US 183 going northwest from Woodward about 7:30 AM. The temperature was in the mid 50s, the sun was shining, and the wind was pretty calm. The road was initially separated four lane, but changed to two lane with a good shoulder. 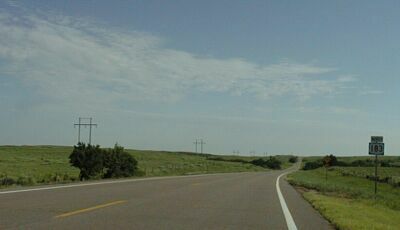 By the time I reached Fort Supply the wind was blowing out of the south at 10 to 20 mph and I was having a great ride. I stopped at a convenience store and bought two honey buns to eat along the way. At this point I wasn't sure that I'd find anywhere to eat before Ashland KS, 67 miles into the ride. I rode on with great tailwinds and nice riding conditions to Buffalo, 20 miles on down the road. Buffalo has a new B+B where I stopped for a second breakfast. The D&D Diner & Bed & Breakfast is not fancy, catering more to working crews than to tourists. A good breakfast cost me less than $4 and a nights stay costs $20. A good place for a bicyclist to stop. There is another restaurant in town as well as a motel, both catering to working folks. I liked this little town and it is on two main routes in northwestern OK; US 183 (north from Woodward) and US 64 (west from Alva). I really liked riding in northwestern OK. The tailwind certainly helped, but the country side is pretty and rolling enough to be fun to ride without having to grind up too many hills. Riding out of Buffalo, I turned north following 183. in this section 183 has no shoulders and some, mostly truck, traffic. The traffic was light and the truck drivers were polite, so there wasn't a problem. It was a bit noisy at times, especially when three cattle trucks passed me in a convoy, but most of the time I was alone in great quiet broken only by bird song and the rustle of the wind in the wheat. Nice! Shortly before I reached Kansas. I passed the large feedlot where all those cattle trucks were headed. Steak on the hoof and lots of it. In Kansas I rode for 12 miles or so to Sitka, hoping the restaurant there was still open. It wasn't, but I stopped and ate a honey bun sitting near the boarded up building. 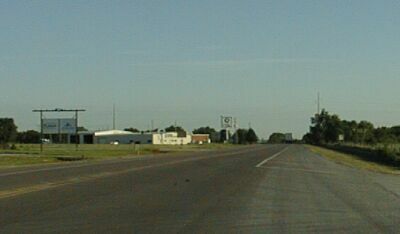 Then I headed north again briefly before turning west on US 160 towards Ashland. Boy was that a shock to the old psyche! Suddenly that nice gentle tailwind was turned into a roaring cross wind and I had to work to keep my bike on the road. My speed was cut in half, but lunch awaited only nine miles down the road so I persevered. It was a little hilly but not bad. Lunch in Ashland (one motel, one restaurant, and one convenience store) was good. I left Ashland heading west, expecting more of the same. What I got was a whole lot of hills. For the twelve miles west of Ashland, riding was not fun. I would crank slowly up a hill at five mph or so fighting the gusty cross wind for control of my bike, especially when I was passed by other vehicles, and then find yet another hill, or string of hills, awaiting me on the other side. It took a long time to cover that twelve miles! 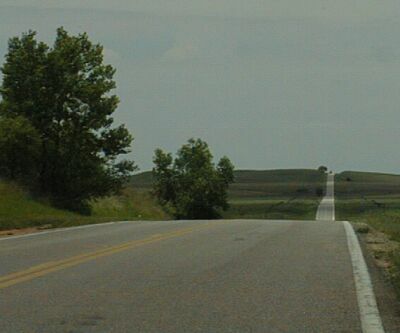 When 160 joins 283, conditions improved as the road curved northward. There were still a lot of hills, but at least I had a the wind helping me, rather than hurting me, as I cranked up them. After 160 leaves 283 heading west again, riding north of 283 was great: good shoulder, light traffic, and a good tail wind. However a new problem appeared: I could see the line of thunderstorms coming in from the west! An added note from the next morning: it is in the low 50s with light rain and the wind is 15 to 25 mph out of the north. Brrr. I'm going to stay in this area for several days, at least three, possibly as much as five days, and I won't be doing too much riding, maybe 50 miles, in the next few days, but this kind of weather (he tells himself!) is why I bring along winter riding gear even on a summer tour. I don't think this will be the coldest weather (I do hope it is the windiest!) I'll be riding in this summer.